On this release i mainly focus on fixing some (small) problems. For engines that dont support this “ponder” flag i was too strict in past – for this i had a discussion on talkchess with some engine developers. With these engines its still valid to enter all analysis modes – therefore its release name. Actually none of the provided engines have this problem, but you can install your owns (say for example: ct800) and then you can use analysis, kibitz, ponder modes again. The only mode not working for such engines is – and stays – brain mode. Cause of that i dont offer any non-ponder-flag engines to you. Speaking about engines: I updated galjoen to v0.37.1 and introduced a new laser1.5 engine. Also based on a small computer tournament Al did for me, i updated some elo settings. In the last discussion on the release v0.9k here i did some improvements for Hans and Maike. Hans wanted to have a timecode inside the pgn file. And Maike is a new picochess user but she had some strange problems with her DGT board. Both features/bugs are done now. Thanks again for share your thoughts or even running some tests on my code. Lucas from DGT also pushed some code to make the BT reconnection more stable (i missed this on former version). For the end of year 2017 i plan another release – im still waiting for the rodent III searchmoves feature – so stay tuned. Thanks again for your help and patience! Galjoen 0.37 has an error, the computer time always jumps back to the start time. hmmm. 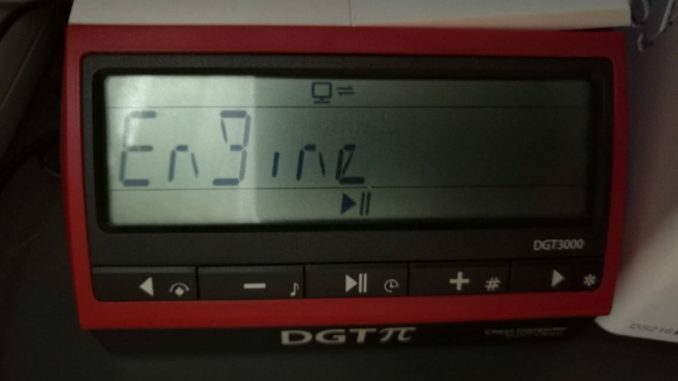 i dont think, this is an engine problem. Perhaps general – but i cant recreate your finding. Is there a clear path how to reach this? Hi. Thank you for your picochess. Is similar i think, is there a tutorial for realize this? Only moves. Without graphic. as y can see its v0.22. Its a special version shiv did that time, but its discontinued. Perhaps i do something similar but with other hardware, for example with adafruit. It happens both at selected Playtime as well as at Fishertime. I cant recreate yr problem, nor Al. For us its working. Perhaps y can forward your log file to me (http://picochess.com/picochess-v0-9k-reconnect/#comment-573)? unfortunately, sending the PGN file to my e-mail address does not work. not pgn file, instead log file – but i guess y would have same problem? *)Is ist possible to get more time controls for example 90min/40 moves +30min for the rest +30s per move? You need to ssh to your picochess box to access them (copy). If you enter your eMail credentials (inside picochess.ini) the finished game including the database of games are eMailed to your box. Thats alot more user friendly. Right now, y can install ONE further time but it must be from the movetime, gametime or fischer. What doesnt work are tournament time controls as y asked for. This tournament time controls will come, but not very soon. I would expect several months, sorry. For now, y need to use “position” to recreate the game. You will loose the moves done before – but you can continue. I know its not the best – well what you asked for, i gonna do sometime (but sooner as tournament time) not exactly what y asked for but it will allow you to continue a former game. Thanks for your answer, but I am a new user of DGT PI (since 24th of December). I have no idea, where picochess.ini is and where I can but my Email adress inside. Is there any website, where I can check some program codes? everything is installed below “/opt/picochess”. The picochess.ini is in /opt/picochess, the games are safed in /opt/picochess/games and so on. Basically, y need to plugin iNet (easiest by cable), login to yr Pi with ssh and enter some linux commands, like “cd /opt/picochess”, “sudo su” and “nano picochess.ini” change the file, and safe it. The “picochess.ini.example” explains what you can do with picochess.ini. If you need detailed help its perhaps better you ask on the picochess forum (https://groups.google.com/forum/#!forum/picochess) or search there for help. Its just easier to write alot of detail text there 🙂 … I hope y enjoy yr christmas gift! Do you have the standard v0.75 image on yr PI, or did you already update this (if yes, how or which image y use)? I have auto-update enabled on my DGTPi, but the latest version I get is only 0.9j – so no “k” or “l”. Is this correct or is something wrong? I also tried the BETA method of pushing the middle button while booting, here I can select 0.9h, 0.9i or 0.9j, also no “k” or “l”. Please help. and post the result. Where you got your (sdcard) image from? you need to update a stretch version. I did that already. I updated with the link form this site to 0.9j Afterwards, I tried to update by middle button push at boot and by seeing auto-update = true. Is there a way to check whether I have a stretch version via a command when loggers into the Pi? it worked ! Thank you. I now have 0.9l. The “sudo git remote add origin https://…” did not work. The message was “fatal error: Origin already exists”, but the “sudo git pull origin master” did job. It has installed the update. I have another problem. The voice stops talking after saying “pico chess” during the boot process. It worked perfectly on 0.9j that I used before. Now I have silence except for the word “pico chess” during boot-up. I figured the solution out myself. It was a picochess.ini messed up from up- and downgrading. Replacing it with a fresh version did fix everything. thats great. Sorry, i am/been too busy to answer y before. Also good, it worked with Horst solution. My last comment was to make sure, yr system takes the sources from correct place (which it does), so the cause of problem y had is still unclear. I hope, the next release coming very soon, allows y to take another try – with standard way for sure. Sorry, but I have some problems with the version 0.9l.Some engines do not function more correctly. Galjoen and Texel freeze or do not react after a few minutes any more. On my DGT board the newest Firmware 3.01 is installed. Version 0.9e still ran perfectly. I use regularly the image files which makes available more of the Support of my DGT-Pi. I am absolutely helpless. to help you, i would need the log file. Are y able to login via ssh to yr pi? But i doubt its the engines by itself. For Texel i never had any problems for years. I think, its something else. I am not a computer-expert. Maybe, I would do it with exact instructions from you.I do not know it. This also seems to me strangely. Above all, because the version 0.9e well functions. interesting alternative and it seems to be a really good description. I will try it. Thanks! I’m using 0.9l on DGT PI. What are the steps to use Modus REMOTE, to play with/against player over internet. The PI is connected to the Internet, the web interface works fine, but when entering room and nick, always got an “error room” on display. Start in NORMAL, entering the WEB-Interface, give room and nick (small “error” on web display), changing to MODUS REMOTE -> error room.